Today, an Omamori (お守り) came to me in the mail. When I was in Japan, I developed an addiction to omamaori. I got at least one of those at every temple I’ve ever visited. My friend was very considerate as to support my habit and now I get my lucky charm when ever she visits a temple in Japan. This one is from the Isejingu‘s (伊勢神宮) Geku (外宮). Omamori usually comes in more of a rectangular shape, a comma shape one is unusual. Some say it symbolizes the Magatama Pond in Geku. It comes in different colors but some how my friend picked orange, a color that has been a favorite lately. How did she know?? 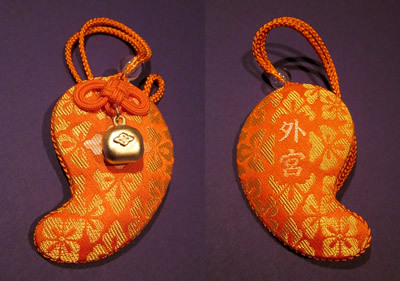 This omamori is for “opening fortunes” and I’ve attached it to my bag and ready to enjoy the good luck everywhere I go. This entry was posted in Musing and tagged geku, isejingu, omamori by n2n. Bookmark the permalink. This object, along with the sentiment, is beautiful. I’d like to forward the pertinent parts to my friend Susan, who is a lover of things Japanese, only I’m not sure how to do that. Linda, thanks for your comment. The omamori is from a friend who might have been a Geisha in her last life. She, too, loves Japanese things. Copy it, past it into an email to Susan, then send! And by the way, this applies to any web page you like to share with other people. Just find the page URL (http://……) on the top.